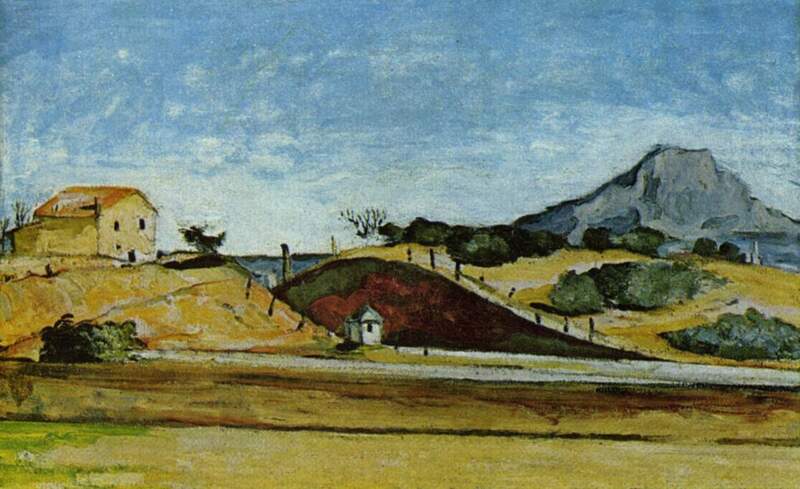 Paul Cézanne (1839–1906), The Railway Cutting (c 1870), oil on canvas, 80 × 129 cm, Neue Pinakothek, Munich, Germany. Wikimedia Commons. As another of the primary colours, yellow is a vital paint for artists. For centuries, there weren’t any particularly good greens which were also enduring, so most oil and watercolour paintings have relied on the mixture of blue and yellow to generate most of their greens. Many yellow pigments in use, even into the twentieth century, have also shown a pronounced tendency to fade. So when someone comes along offering you a ball of compressed powder which is an intense yellow, and appears more lightfast than most that you already have, you’ll believe anything that they say. It comes from the urine of cows? No worries – how much, and when can you deliver? This seems to have been the story behind the introduction of Indian Yellow into European painting. It had a long track-record of use in and around the Indian sub-continent, where it had featured in watercolours and gouache, and buyers in Europe were only too happy to pay quite high prices for it when it became available. 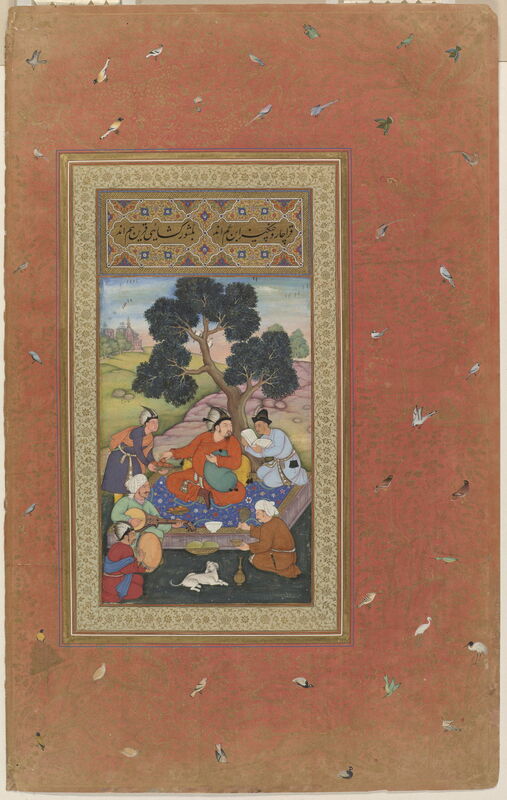 Artist Unknown, Mongol Chieftain and Attendants, folio from the Gulshan Album (Rose Garden album) (Mughal, c 1600), opaque watercolor, ink and gold on paper, 42.3 x 26.5 cm, The Freer & Sackler Galleries (https://www.freersackler.si.edu/object/mongol-chieftain-and-attendants-folio-from-the-gulshan-album-rose-garden-album/), The Smithsonian, Washington, DC. Courtesy of and © 2018 The Freer & Sackler Galleries, The Smithsonian. This exquisite watercolour miniature showing a Mongol Chieftain and Attendants from the Gulshan Album now in the Freer and Sackler Galleries is a good example, from around 1600. Its yellows and greens have lasted those four centuries very well, and careful testing by Elisabeth FitzHugh has shown the unmistakable presence of the chemicals known to be diagnostic of real Indian Yellow. The snag with European paintings is that so few works have been tested, and records are so scant, that we don’t even known when Indian Yellow was first used to the west of the Middle East. 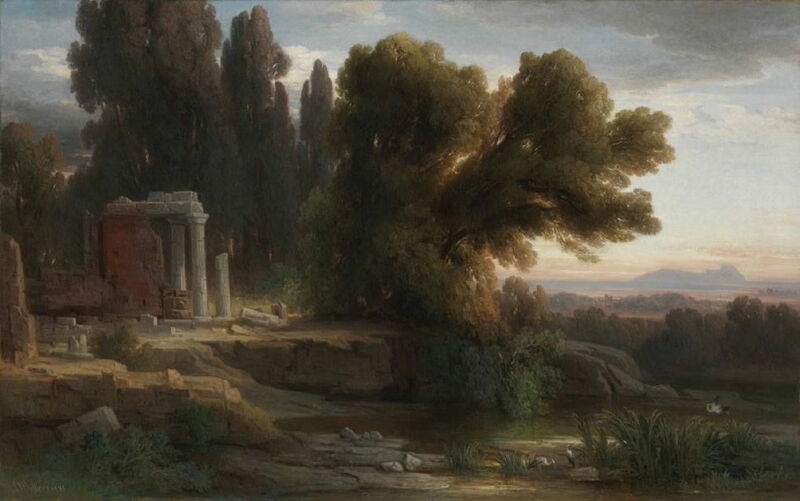 Ernst Willers (1802–1880), Grove Near Ariccia in the Evening Light (1873), oil, dimensions not known, Bayerische Staatsgemäldesammlungen, Munich, Germany. Wikimedia Commons. Ernst Willers’ Grove Near Ariccia in the Evening Light (1873) is one of the few European paintings known fairly unequivocally to contain Indian Yellow, used perhaps in forming its rich greens. We know with rather greater certainty when Indian Yellow came off the market, as by the end of the nineteenth century supplies had essentially dried up. The claim is that, between the late 1500s and then, some Indian herdsmen fed their cows with mango leaves, collected the cows’ urine, and dried it to generate the pigment as balls of compressed powder, some of which still exist. In the nineteenth century, this was increasingly viewed as being cruel to the cows, and the practice was progressively eliminated. Whether this story is accurate, or indeed the pigment ever saw much use, remains open to doubt. Certain claims, for example of a ban on the production of the pigment from 1908, have not been verified and appear legendary. But there is evidence that some artists in both India and Europe used the pigment in their paintings. Chrome Yellow, a family of pigments ranging from pale lemon to deep orange-red, is based on lead chromate, which had been ‘discovered’ as a mineral in the middle of the eighteenth century. Its use as a pigment wasn’t recognised until the early nineteenth century, when it became increasingly popular and versatile. Initially, its supply was quite limited, and it was expensive as a pigment as a result. As general commercial demand for the mineral increased, new sources of supply were found, and its price fell accordingly. During the latter half of the nineteenth century it was probably the mainstay yellow and orange in the palette of most painters. 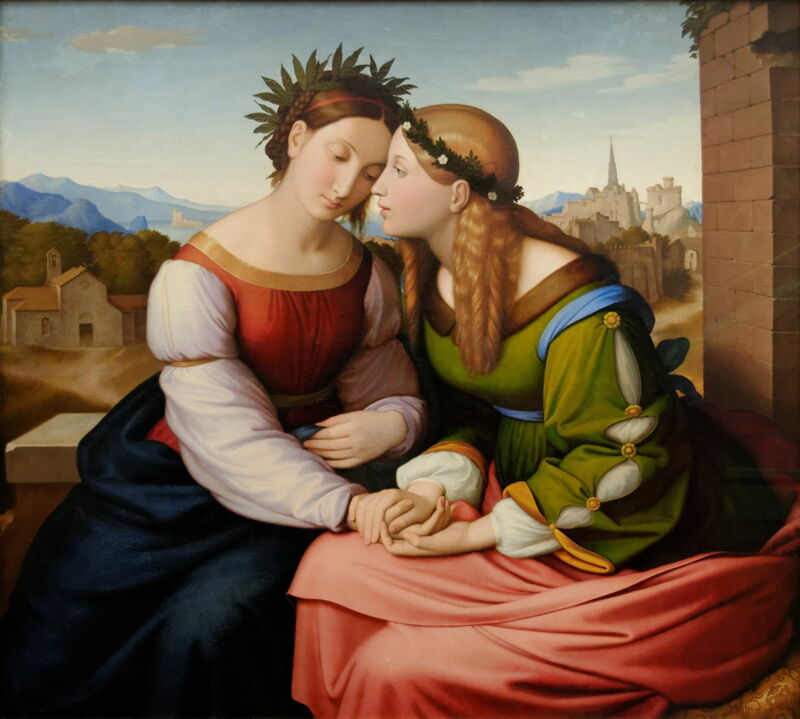 Johann Friedrich Overbeck (1789–1869), Italia and Germania (Sulamith and Maria) (1828), oil on canvas, 94 × 104 cm, Neue Pinakothek, Munich. Wikimedia Commons. The first evidence of the use of chrome yellow as a pigment in painting dates from just before 1810. Johann Friedrich Overbeck’s painting of Italia and Germania (or possibly Sulamith and Maria) was made in 1828, and is thus from the early adoption phase, when the pigment was expensive and encountered fairly infrequently. Although Overbeck was restrained in his use of colours from orange through to yellow and green, he has achieved a subtle chromatic effect in the green fabric. Carl Blechen (1798–1840), View of Assisi (1832-35), oil on canvas, 97 x 147 cm, Neue Pinakothek, Munich, Germany. Wikimedia Commons. 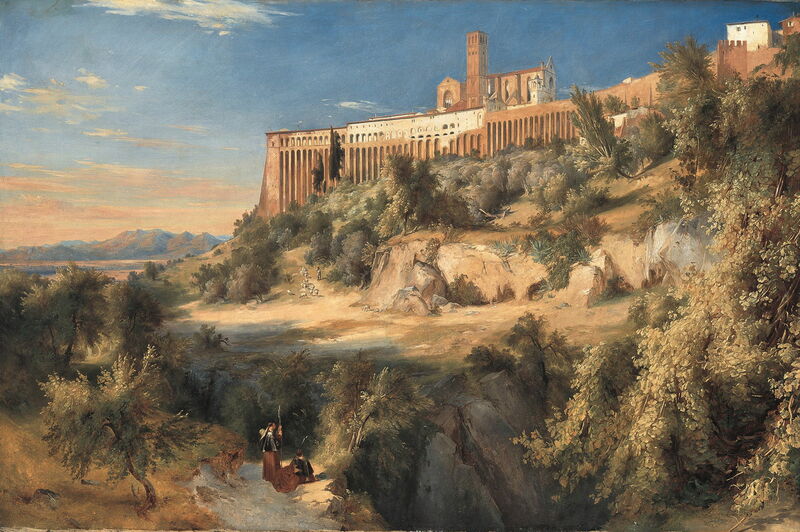 Carl Blechen seems to have used Chrome Yellow more extensively in his imposing View of Assisi, painted a few years later in 1832-35. By this time, the mixture of Chrome Yellow with Prussian Blue had become known as Green Cinnabar or Chrome Green, although the chromium salt used was not itself green, of course. Prussian Blue was one of the first major ‘modern’ synthetic pigments, and had been introduced a century earlier. 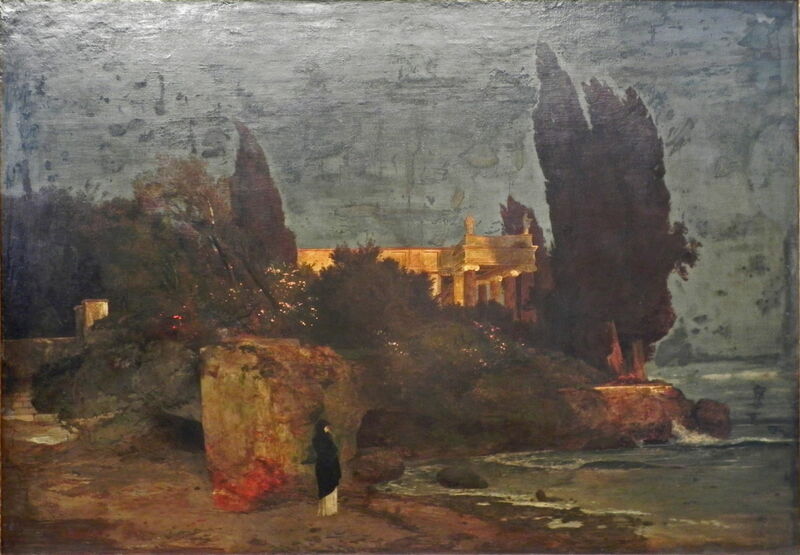 By the time that Arnold Böcklin painted this, his first version of Villa by the Sea in 1864, Chrome Yellow had established itself as standard. However, this is one of a relatively small number of works which use the pigment in an almost encaustic mixture of resin and wax. Chrome Yellow was widely used by the Impressionists and shown at the Salon, and is demonstrated well in Paul Cézanne’s famous painting of The Railway Cutting (c 1870). I believe that most if not all of the greens seen here rely on Chrome Yellow mixed with blue. As some of the Impressionists, like Claude Monet, generated more income, they could afford to start using the newer, and far more expensive, cadmium-based pigments which were coming onto the market. Cadmium Yellow is considerably more lightfast and durable than Chrome Yellow, so during the late nineteenth and early twentieth centuries, many painters switched away from Chrome Yellow. Walter Crane (1845–1915), Neptune’s Horses (1892), oil on canvas, 33.9 × 84.8 cm, Neue Pinakothek, Munich, Germany. Wikimedia Commons. Walter Crane’s Neptune’s Horses (1892) is one of the later works which apparently still relied on Chrome Yellow. During the twentieth century, Cadmium continued to displace Chrome in pigments for paints ranging from lemon to orange-red. However, both are potentially environmentally damaging, and in this century more modern, less toxic synthetic organic pigments have been introduced as substitutes. Thankfully, as both Cadmium and Chrome pigments trap their toxic salts in insoluble particles, neither presents any danger to the careful painter when used in paint. For the pastellist, though, inhalation of pigment in dust is a more significant risk. We shouldn’t forget that Chrome Yellow was one of the key colours of Impressionism, and a great deal of nineteenth century landscape painting. Posted in General, Painting, Technology and tagged artists paints, Böcklin, Blechen, Cézanne, Crane, history of painting, Overbeck, painting, pigments, Willers. Bookmark the permalink.